German is a fun language--from what I can tell, there's a lot of phlegm-rattling and that's always a good time. Plus, some of their words are ridiculously lengthy. Try saying whoppers like vergangenheitsbewältigung and schwangerschaftverhütungsmitte five times fast. I like their food, too--I'll take all but the worst of the wursts, the warm potato salad, the spaetzle. Good stuff. I was all set to list German chocolate cake among those, and then I found that its conception wasn't German at all--it's named after an American man called Sam German. Oops! Regardless of its origins, I love the flavors combined in German chocolate cake. The chocolate itself is subtle yet just rich enough, and the frosting, which consists of toasted coconut and pecans swathed in a custardy goo, is hard to resist simply eating with a spoon. These cookies include all of those aspects (save the custardy goo), and they are an absolute pleasure. They're hearty and thick and full of crunchies and chewies and tasties. Be sure to toast both the pecans and the coconut--it changes the texture and flavor completely! Spread the coconut and pecans on a rimmed baking sheet and toast in the oven, stirring occasionally, for 7 to 9 minutes, or until lightly browned; be careful not to burn. Let stand until cool; set aside. In a medium bowl, thoroughly stir together the flour, baking powder, and salt; set aside. In a large bowl, with a electric mixer on medium speed, beat together the brown sugar and butter until very well blended and light. Beat in the egg, corn syrup, vanilla, and coconut extract until well blended. Beat or stir in the flour mixture, then the pecans, coconut, and chocolate, until evenly incorporated. Drop the dough onto the baking sheets by heaping measuring tablespoons, spacing about 3 inches apart. Using the tip of a table knife, spread out the cookies to about 1 1/2 inches in diameter. Bake the cookies, one sheet at a time, in the upper third of the oven for 6 to 9 minutes, or until lightly browned all over and slightly darker at the edges. Transfer the sheet to a wire rack and let stand until the cookies firm up slightly, 1 to 2 minutes. Using a spatula, transfer cookies to wire racks. Let stand until completely cooled. coconut and pecan! I love the sound of that! I love everything about Germany! Those cookies look amazing. Those cookies look delightful! Ja, ja! My favorite German word: Staubsauber. It means vacuum. Doesn't the word sound like a dirt-sucking machine? Pst.. one of my favourite cakes is the black forest cake, partly because Schwarzwalderkirschtorte is an awesome word to say. I love German Chocolate cake so these cookies sound awesome to me!! I think I will bake some of these soon and I put this recipe high on my list to make at the holidays!! Your cookies look wonderful. German Chocolate Cake has been my favorite since I was a little girl. Hmmm - can you really do without custardy goo? Glad I don't have to say that in German.... I've fall all over my tongue and never get to order what i want. Having a German in the family makes it all the more fun ;-) These cookies look herrlich! I love that you took all of the components of the cake and turned them into a wonderful and tasty cookie...great job Grace! I adore German food! I have two German cookbooks which are in their native language that I have been trying to transcribe for years. At this moment though I can't think of one single word because I'm feasting my eyes on those irresistible cookies. I can not believe German Chocolate Cake is named after Sam German!!! Who knew?? This is my kind of cookie!!! I love german chocolate cake and in a cookie = perfect! Saving this recipe!!!! JaJa wunderbar cookies!! Lived in Germany for a while and learned to appreciate the food! I took German in high school eons ago and now I'm wondering why my German teacher never brought us any wonder cookies like these? I feel cheated. But at least now I can make them myself (even if the German Cake flavors aren't necessarily authentic). What creative cookies. Sehr lekker! My in-laws are going to love me forever! 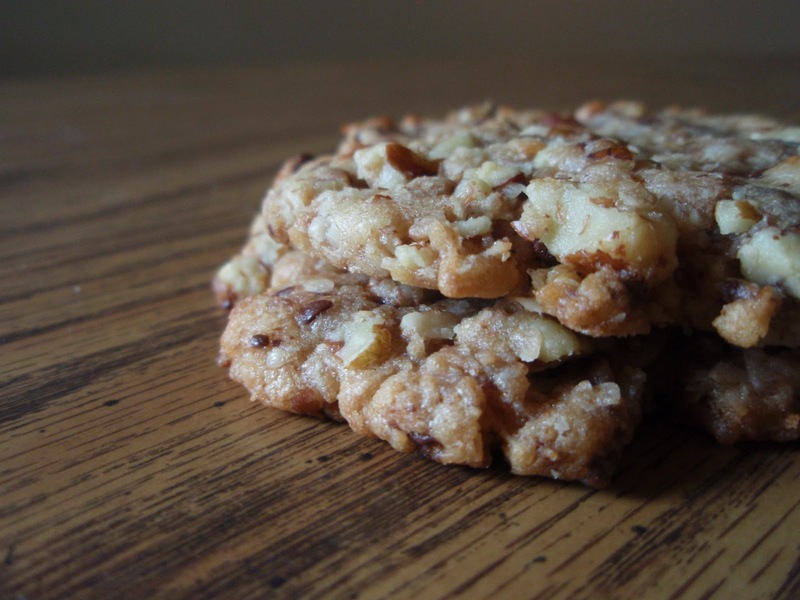 Great idea to make the cookies with the flavors of German chocolate cake, scrumptious! What's not to love about this recipe?? German Chocolate Cake....you've seriously met your match. I should know better visiting your blog before I have had my morning coffee or even breakfast.Now I am so hungry! Would love to try these... they sound wonderful! What a great idea turning them into cookies! interesting to know the origin of german chocolate cake. These sound delicious, I love toasty nuts! thanks for sahring the history, loving these,I bet a could eat a ton!! The cookies look great...I can't even imagine saying "vergangenheitsbewältigung" one time! LOL isn't German a really interesting language? And I had no idea that the German chocolate cake was named after a man called Sam German! I thought it was from Germany! 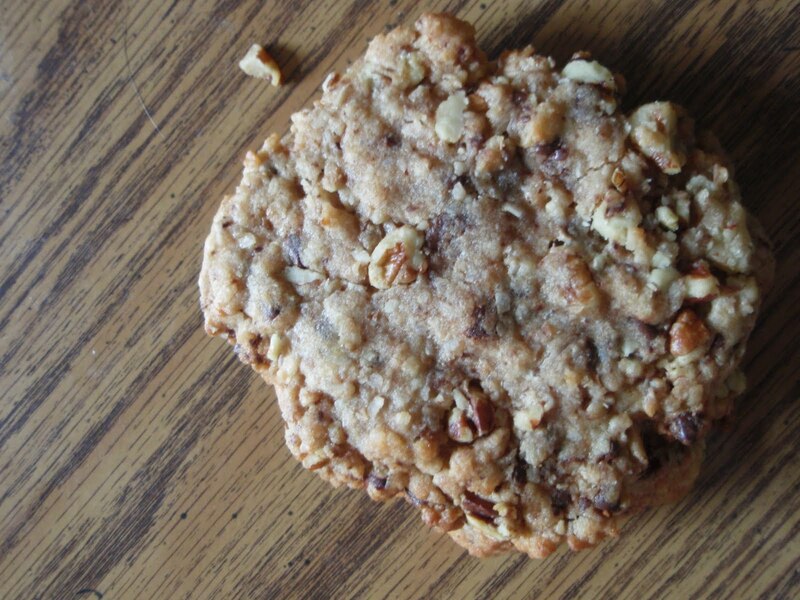 A German chocolate cake in cookie form is just genius. That's one of my favorite cakes, but it usually requires a special occasion. Love that I could bake these cookies instead any time! These look like a delight of textures and flavors. My huz would love them with the coconut. Wow!!!!! !Those cookies look delicious! !I could eat a dozen of those. A heck of a lot of love & dang good ingredients went into these cookies. blissful. These cookies would make my mouth sing with joy... beautiful! Those cookies must be from Wonderland because they definitely say, "Eat Me!" The cookies are fabulous, utterly moreish! Grace, these cookies look great...coconut, chocolate and pecan...cannot go wrong! Great recipe. Ich bin ein german chocolate cake cookie fan! Now I am so hungry! The cookies are fabulous! Wait, German chocolate cake ISN'T GERMAN?!?!? You just blew my mind. Either way, the flavors are awesome and so are these cookies! Meine Güte, sieht das göttlich! They look the perfect amount of gooey, Grace! Your cookies look a) delicious and b) huge, which pretty much makes them perfect in my book! And I am ashamed to admit that I used to always ignore the instruction to toast nuts or coconut, but after actually doing it once it really does change the flavour completely. These sound super delicious. I've got some German blood in my heritage, but beyond German Chocolate Cake I've never really explored it! I think I'd rather have these cookies than cake, though. My favorite German food- although there are a few, like the ones you listed- but my all time favorite is the German Potato Salad. Great Cookies! The only change I made was to refrigerate the dough overnight before baking. I will make these again!